This event will last approximately 1 hour and 45 minutes. 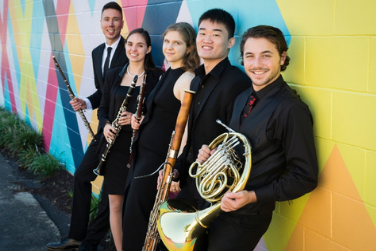 Wavelength Winds is the University of Maryland’s premier fellowship wind quintet. The ensemble commissions new works, creates innovative projects, and engages in collaborations that put classical music in a culturally relevant context. This year Wavelength Winds co-commissioned a new quintet by John Steinmetz, a work for which they have exclusive performing and recording rights for a year. A total of four new commissions will be featured on this recital.